The Old Courthouse dome had significant rot (estimates suggested it would have collapsed within the year) and was no longer structurally sound. The structure of the dome and supporting roof was repaired. The dome itself and roof were re-clad in copper to ensure durability and low maintenance. The entire Sheriff’s House roof was replaced, along with the windows and front door, and the dark cornices have been stripped and repainted. 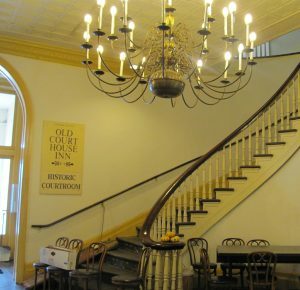 The front stairs to the Old Courthouse and Sheriff’s House were replaced. After Pictures of upper staircase. The masonry work has been completed and the exterior looks fantastic! Before Picture of Exterior Back of the Old Courthouse. After Picture of Exterior Back of the Old Courthouse. And a window became a door on the Ground Level Side of the building!